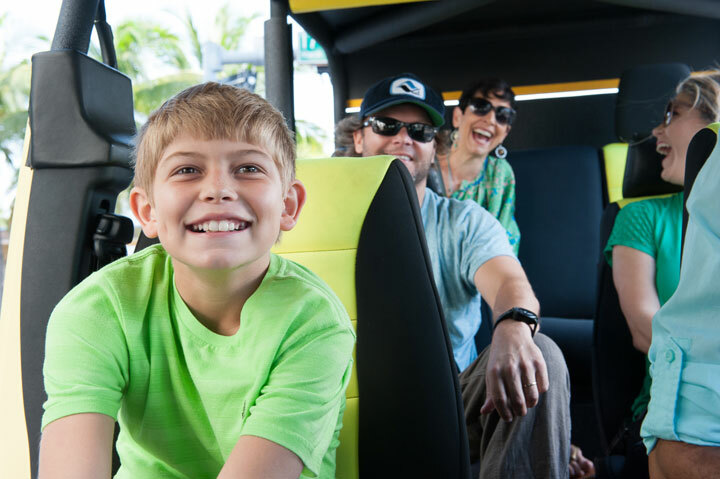 Our private tours create fun, lasting memories for our guests. We provide you the opportunity to explore every facet of our unique City and its surroundings. We offer tours for outdoor enthusiasts, history buffs, architecture lovers, foodies, and adventurers. Our professional guides are smart, fun and polite and they will exceed your expectations in every way. We will help you get the most out of your time in Miami. Book one of our unique tours below or let us customize a tour specifically for you. 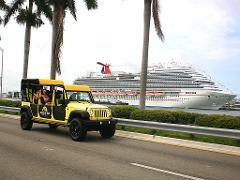 This private tour is a great way to begin your trip to Miami and familiarize yourself with our beautiful city. We take you to the best parts of Miami. We can customize the tour to include stops for food, drinks, and shopping, or anything else you might want to do or see. Our guides are smart and fun, and they will impress you with their knowledge of our City’s history, architecture, and culture. Let us be a fun introduction to all our wonderful city has to offer. This tour includes stops at Wynwood Walls and in Little Havana and additional stops can be added upon request. The tour route begins in South Beach, playground of the rich and famous and home to the largest collection of Art Deco architecture in the world. 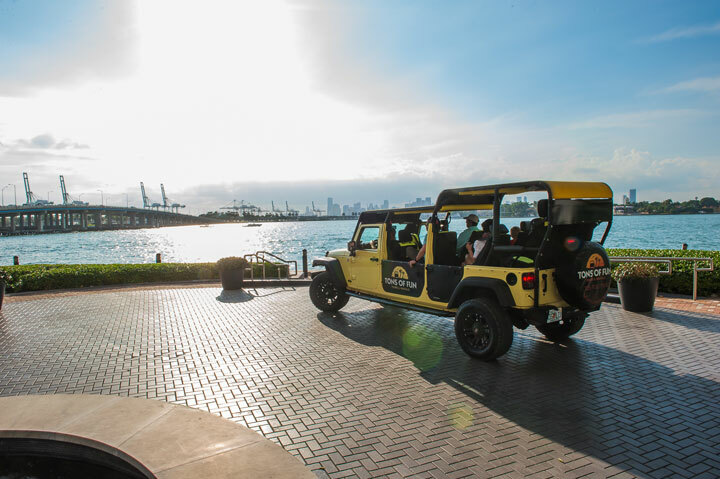 We then take you through Biscayne Bay via the historic Venetian Causeway where you will experience one of the best views of downtown Miami’s skyline and some of the 32 man made islands that dot Biscayne Bay. Once on the mainland, we head to the Wynwood neighborhood, one of the fastest growing art enclaves in the U.S. Wynwood uses redesigned warehouses as enormous canvases for world renown street artists and contains over 70 galleries and restaurants that display up and coming artist’s works as well as high end private and public collections. 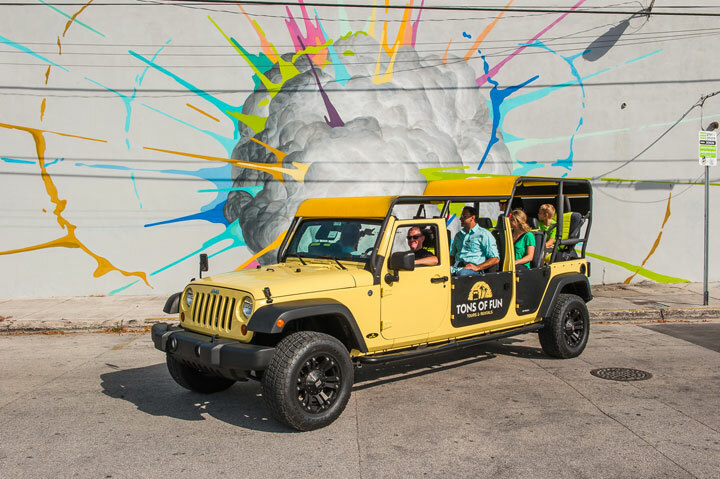 We take a short break here and give you a guided walking tour through Wynwood Walls, a unique park containing the world’s largest outdoor collection of museum quality street murals. Next up is the historic downtown and Brickell area, continuously inhabited for over 5000 years by Native Americans, Europeans and finally Pioneers; this is where the City of Miami began over a hundred years ago. Brickell is one of the fastest growing areas of town with luxury hotels, over 300 international banks and some of the most popular restaurants and nightspots in town. We then take you somewhere no other tours go: across the Rickenbacker Causeway to Virginia Key and Key Biscayne. The Rickenbacker offers the best view of the Miami Skyline and is truly a sight to see. We then take you into Coconut Grove, one of Miami’s prettiest and most eclectic areas. 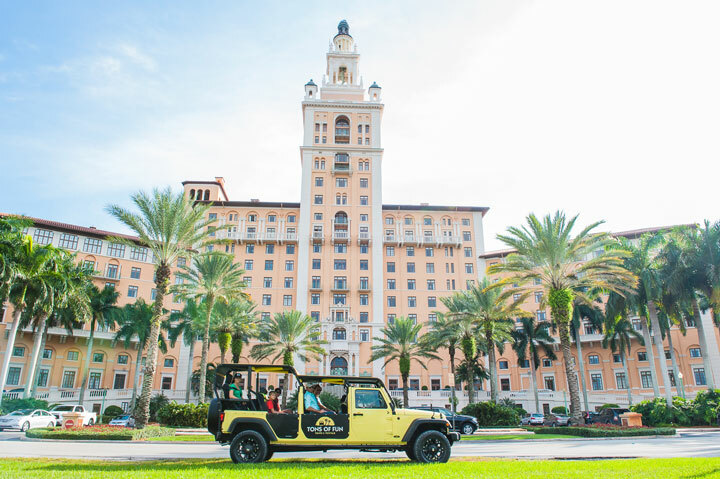 The Biltmore Hotel and the City of Coral Gables is up next and it is one of the finest examples in the U.S. of the City Beautiful Movement of the 1920s. Coral Gables is a meticulously planned community with a distinctly Mediterranean Revival Style, large fountains arched entrances, and tree lined streets. The ‘Gables’ is home to the famous Biltmore Hotel, The Venetian Pool, and The University of Miami Campus. The next destination is one of Miami’s most culturally significant stops….Calle Ocho in the heart of Little Havana. Filled with music, cigar stores, Cuban restaurants and bodegas, this neighborhood is where Cuban exiles settled after fleeing the Castro regime and is considered the soul of the Cuban community. We take a short stop here at Domino Park, allowing you to sample some Cuban coffee or an authentic mojito and experience the vibrant culture of this unique Miami neighborhood. We then travel back over the MacArthur Causeway, past Star Island and Palm Island. The tour comes to a magnificent close as we pass very close to enormous cruise ships that are waiting to cast off! Experience the best of Miami with us! This popular tour focuses on South Beach and the two gorgeous causeways that connect it to the mainland. If you don’t have much time and would like to take a great tour through the Art Deco District, SoFi neighborhood, and Biscayne Bay, this is a great option. Your guide will fascinate you with interesting stories about South Beach and the characters that turned this marshy island into one of the most popular destinations in the world. Let us show you the best parts of south beach! 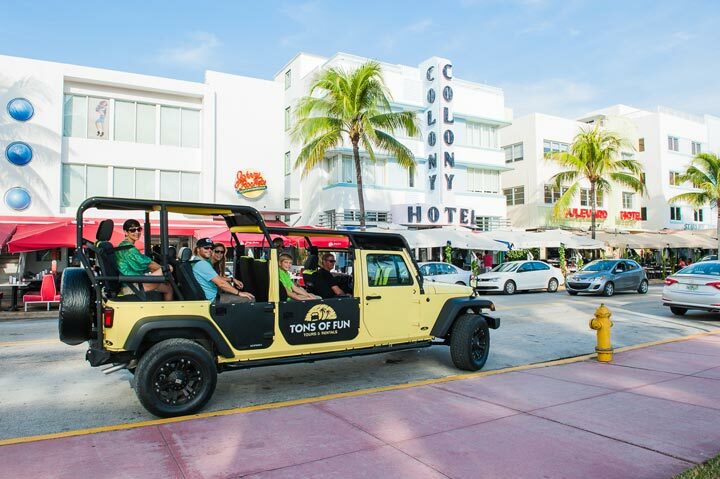 This private tour takes you to the best parts of South Beach. South beach is more than Ocean Drive and its iconic Beach. Let us introduce you to Espaniola Way, Sofi, Lincoln Road and more! Our guides will amaze you with tales of the amazing characters that turned this swampy peninsula into “America’s Riviera.” Hear stories about Rum Running during the roaring 20’s, and the preservationist movement of the 1980’s while cruising through the world’s Largest Collection of Art Deco buildings. From quaint residential streets to bustling dining and shopping venues, South Beach is an eclectic mix of people, moods, and architecture. After we explore south beach, we take you over the Venetian Causeway and across Miami’s true gem, Biscayne Bay. The Venetian islands create a peaceful enclave that is home to exquisite waterfront real estate in numerous man made islands where cyclists and rollerbladers highlight a secluded outdoor oasis. We then take you through the performing arts district in Miami and back to Miami Beach via the MacArthur Causeway. 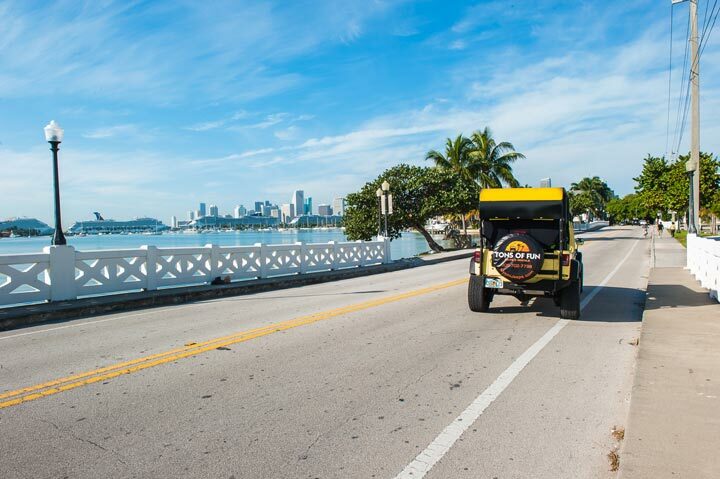 The causeway offers stunning Miami skyline views and a glimpse at the world famous Star and Fischer Islands. It is the perfect ending to a wonderful tour. 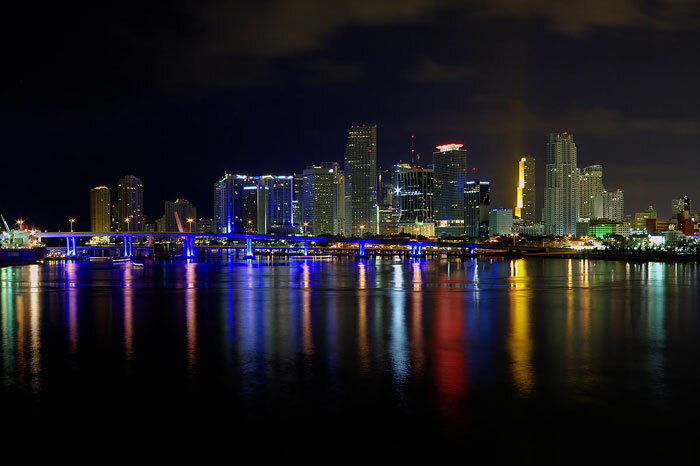 See Miami’s dazzling nighttime cityscape and bustling nightlife during this 3-hour private tour. Our professional guide will take you through Miami after dark to view historical landmarks in Biscayne Bay, the Art Deco buildings of South Beach, estate homes and celebrity-laden islands, and the City’s most vibrant night spots. We can also customize the tour if there are specific places you would like to go or stops you would like to make. All you have to do is ask your guide! Our night tour is a great way to spend an evening in Miami! Looking for something fun to do at night with your friends or family? Book this tour! Miami is gorgeous after dark and the best time to people watch is when the sun goes down and the “interesting” people come out to play! We offer Miami’s only night tour and it is completely private. This 3 hour tour begins in the Art Deco District of the world famous South Beach and takes you across the historic Venetian Causeway through some of the 32 man made islands that dot Biscayne Bay. 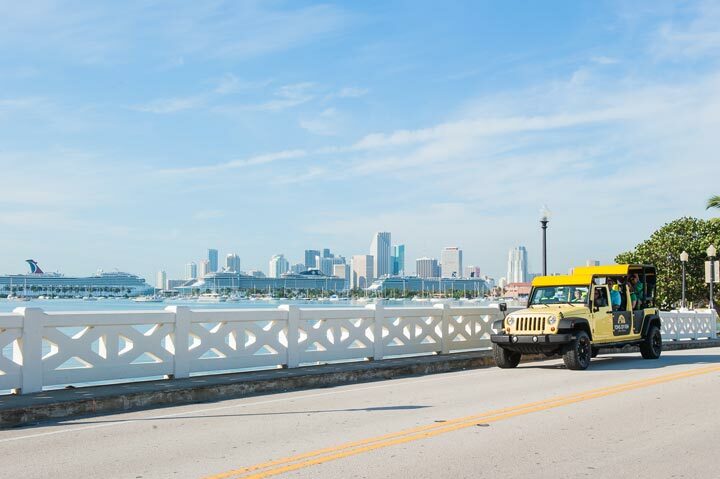 The causeway offers an incredible view of MIami Downtown skyline and the Port of Miami. Once on the mainland, we take you through downtown Miami, past the Performing Arts Center, the American Airlines Arena, Bayfront Park and the Miami Tower. Our tour then takes you down beautiful Brickell Avenue. Brickell Avenue looks like a canyon of lights with shimmering glass high rises and ultra modern skyscrapers. The buildings on Brickell Avenue demonstrate how the condo “boom” changed the Miami skyline forever. Next up is Key Biscayne and the drive over the Rickenbacker Causeway. Key Biscayne is one Miami’s crown jewels and The Rickenbacker Causeway offers some of the best views of a city skyline anywhere in the world. South Miami Avenue is up next, and it is one of the prettiest and most uniquely situated residential streets in all of Miami. South Miami Avenue leads you into Mary Brickell Village, one of the trendiest places in town. Lastly, the tour takes you back to South Beach via the MacArthur Causeway. On this causeway you will see some of Miami’s finest waterfront mansions on Star and Palm Island, and get an up close look at the enormous cruise ships at the Port of Miami. Our night tour is a great way to spend an evening out on the town.